Nepenthes spathulata X veitchii "red stripe"
This is a hybrid between two highlanders; N. spathulata and N. veitchii "red stripe". 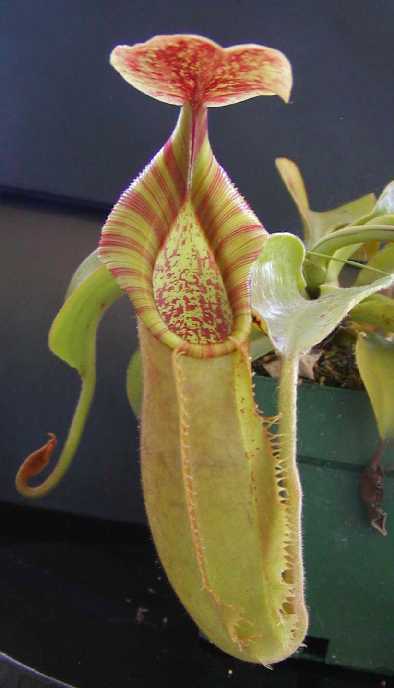 There's another plant on the market called N. X "Judith Finn" that is mentioned in Peter D'Amato's book The Savage Garden with the same parent species. Mine isn't called "Judith Finn" probably because the other plant is a cultivar. I hope I said that right. Anyhow, I bought this plant primarily because of the "red stripe" veitchii cross in it. It should be a gorgeous hybrid! The peristome is light red now but should darken with the next succeeding pitchers which I will update when they form. I've had no issues with this plant since arrival. It has been somewhat of a slower grower than some other highlanders because of the N. veitchii in it. I've also noticed that it stresses a little to increased light levels and lower temperatures than my other highlanders. I believe N. veitchii is a species that tends to like lower light levels than others. Other than that this is a readily available hybrid that is easy to grow.